This week in Literacy we have been looking at the poem ‘The Magic Box’ by Kit Wright. We have written our own versions and added alliteration and similes. Have a look and tell us what you think. a twinkling star from a from frightening cave. the touch of a spicy fishes fin as dangerous as a dragons tooth. a never ending road that leads you to a shop full of dresses. a first smile of a little, cute baby. a deep, hot pool with bubbling water. the smell of a tasty, yummy BBQ in the garden on a summers day. a star as cold as ice. a bright sun glowing like a yellow, shiny metal bucket. Chicken Update! 3 weeks old! This morning we have written some listed poems in groups of 2 or 4. We read the poem ‘Ten things in a Wizard’s Pocket’. We wrote our own poems and changed the title, have a read and tell us what you think. Some problems which can’t be solved. A ghost dripping with blood. A sea of melted ice-cream. A minute dinosaur walking in the sea. A strange, magical, disappearing castle. A fountain of melted chocolate. Ten things found in a Robber’s Pocket. A swimming pool without water. Some men with a TV stuck to their head. A diamond lock leading to a new universe. A loud meow from a gigantic cat rampaging through the streets. A box of singing treasure from the ocean. A scream from a man with 5 legs. The footsteps of a walking house. A boat sailing through the air. 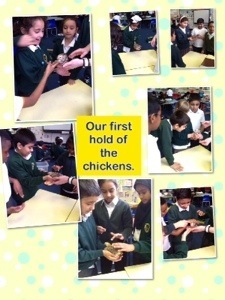 By Janis, Simran, Aisha and Faizah. Ten things found in a Robot’s Pocket. A shiny diamond with a hundred wishes. A train as large as a mountain. A bowl of colorful jelly. A bag of a thousand balloons. A bucket of sweets that left forever. By Aminah, Ihtisham, Haaris and Cherry.